STAR TREK: KHAN - Review | Warped Factor - Words in the Key of Geek. In this weeks Star Trek Column Matthew Kresal takes a look at the recently released graphic novel, Star Trek: Khan. The release last year of Star Trek Into Darkness has inspired interest yet again in one of the franchise's most memorable villains: Khan. In particular, the casting of Benedict Cumberbatch into the role made famous by Ricardo Montalban decades before opened up both controversy and a new set of questions. Setting out to explore Khan's origins and answer some of those questions is this volume which collects the five issues of the IDW's miniseries that through from late 2013 and early 2014. So does it serve Khan justice in telling his story? It's worth keeping in mind that Khan's origins had already been explored in some depth a decade or so ago in the two Eugenics Wars novels written by Greg Cox (with a third novel later filling in what happened between the TV episode Space Seed and Star Trek II: The Wrath Of Khan). Those novels recognized a basic problem of Khan's background: That Khan left Earth in the 1990s during the Eugenics Wars but the Eugenics Wars didn't take place in our world (or any of the later Trek episodes set during the period). So to portray it, one has two options: work into the real world or literally rewrite history. The two Cox novels instead turned it into a shadowy conflict often behind real world events which came to involve Gary Seven, Roberta Lincoln and featured appearances by a number of other 20th century Star Trek characters. The Khan graphic novel here takes the latter option with less than spectacular results. The first three issues (or chapters as they're refereed to here) cover Khan's background through the Eugenics Wars and the Botany Bay taking off from Earth, via the framing device of Khan being put on trial as part of off screen events towards the end of Into Darkness. This section suffers from two fundamental problems. The first is that to fit in the quarter century of time the first three issues cover - from our first meeting Khan as a homeless amputee in 1971 to New Delhi to the Botany Bay launching in 1996 into the necessary page count - the story is forced to jump around a considerable amount meaning that we really only get the broad strokes of Khan's life and events. More especially, we're given only brief glimpses of the Eugenics Wars themselves which, while presented as something akin to a world war in the narration Khan gives, is visually represented by a handful of action movie style set pieces. That fact means that the significant rewrite of history done here never quite works (and interestingly the story itself doesn't keep to its own continuity with a character appearing in a location within pages of it having been destroyed). The second problem is the characterization of Khan himself. We're presented visually with the Ricardo Montalban Khan in this section of the story but the writing never quite captures that Khan. Instead we're presented with what very much seems to be the Cumberbatch Khan in terms of dialogue and actions but simply presented with Montalban's face. The result is an odd one and, combined with the issue mentioned in the last paragraph, does considerably undermine a large portion of the story. Where things get better is in the final two issues/chapters where we meet the Cumberbatch Khan and it fills in some of the events that would eventually lead towards Into Darkness. Even here, the story is reduced to presenting broad strokes, though we do get to see some of the pivotal events that tie into the film's plot. Amongst those is a confrontation between Khan and Admiral Marcus that answers perhaps the single biggest question from the film about Khan's change of appearance. These latter two chapters are the biggest highlight of the volume and really what makes it worth reading. Artwork of course plays a big role and arguably here the volume is more successful. All of the characters from Into Darkness are recognizable with Cumberbatch's Khan, Kirk and Spock being especially well represented. The Montalban Khan is recognizable though it's only in a couple of moments that the artwork really captures a good likeness of him. The artwork also makes some nice calls back to elements established in some of the original Khan appearances, from the ship that finds him to the look and feel of the Botany Bay itself. The artwork at times makes up for what the writing lacks, though even that can't make up for all the faults. 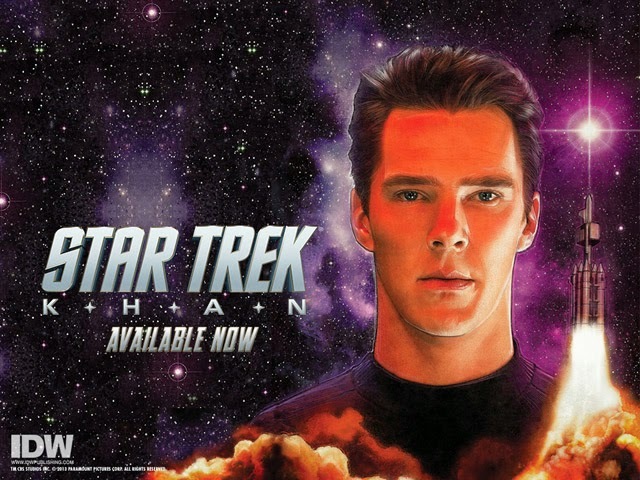 In the end then, Star Trek: Khan is intriguing if disappointing. Despite attempting to present the Eugenics Wars as a massive conflict and Khan as a grand ruler, the way both are presented here are disappointing due in large part to trying to do too much with too little space and the lack of proper characterization for Khan himself. While things improve in the latter part of the story, and there's some good artwork on show, it's not enough to really salvage the earlier flaws. In a way, one almost wants to take those latter parts and combine them with the two Cox novels to create a definitive story for Khan because, for all of the efforts made here, this isn't it.